Oleana is a neighborhood restaurant with a strong focus on flavors and comfort. The cuisine centers on the Arabic influenced foods of the Mediterranean with a strong lean towards Turkish fare. Winter months feature a roaring fireplace and in the warm weather the gorgeous garden is open for dinner. There are two lots available for guest parking after 5:30pm. One is directly across the street from the restaurant. The other is diagonally across the street at the E.L.I./Fitness Together lot. Been to Oleana a handful of times, and have always been happy with the meal. I have never had a meal at this restaurant that was not excellent, and tonight was no exception. Everything was great. We had been anticipating the visit for about a month. I have Anna Sortun's first cook book, Spice, and love it. The wait staff is amazing-very knowledgeable and professional. The food is outstanding and ordering mezzo allows you to try a variety of dishes. Our biggest problem was that we didn't save room for dessert. We have to go back soon. We like Sarma much better - the food is brighter and the presentation better. It was noisy and all, in all the drive to Somerville is much more worthwhile. We have been going to Oleana for many years - always getting the veg tasting menu. The items were not as varied or inspired as in the past. Several were ordinary at best. The tables are way too close together affording no privacy - has the restaurant added tables? Oleana was such a fantastic take on small plates. Familiar Mediterranean flavors combined in unique and interesting dishes all came together beautifully. was the only negative. Highly recommend. Everything about our meal was distinctive, delicious, and perfectly executed: food, wine, service. My only quibble is how long in advance we had to make a reservation. Plus we had to reserve at an inconvenient time. But I guess that's the price you pay for outstanding dining. Excellent food. Friendly service. Wines are very expensive and average wine list. Perhaps the best meditetranean food in Boston. Must do when visiting Cambridge. The food was very good quality and exotic. We ordered mussels...surprised us that they came lightly fried but perhaps we did not read the menu description closely enough. The lamb came as a stew with some sort of lettuce-like vegetable and we also ordered a side of greens...the combination of the two was more bitter than we expected...individually, the dishes were quite good but the combination was too bitter. So, if I went back, I would read the menu descriptions more carefully and ask the waiter which dishes pair together best. The last time I dined at Oleana was several years ago and it was amazing. After living in NYC and Chicago and now back in Boston, I was so looking forward to returning here for dinner and taking our good friends visiting from California. This time... not the same. The food was still off the charts--delicious and unexpected (except for the desserts--more on that in a moment). But the service was just ok. Our server wasn't rude, but she wasn't friendly either and she seemed to want to rush us through our dinner, even though when we left, the dining room only had a few people seated and no one waiting. The whole vibe was odd and it made me slightly uncomfortable because she seemed either annoyed by us or put off by us, (table of 4 women) which is an issue if she's going to be a server in Cambridge. And then there was the truly sad experience of the desserts. Maura Kilpatrick is one of the most inspired pastry chefs in the business. She has won a James Beard Award and she was getting accolades for her creative and surprising pastry years ago. Sadly, while she is still the exec pastry chef, and new person has taken her place in kitchen and the results are not the same. We had the profiteroles, which must have been made the day before because they tasted slightly stale and like they had been stored in a refrigerator for awhile. The caramel sauce was grainy, like the sugar had not melted completely into the butter. And whatever was crumbled on top tasted like blue cheese and did not complement the dish at all. Very disappointing. The dark chocolate mosaic cake was more like a nougat and less like a cake and was also a disappointment. Too hard--not with the kind of chewy unctuous texture that makes nougat so special--it was also not very flavorful. Again, not the kind of dessert you want to devour, which what I always wanted to do with one of Maura's desserts. Too bad, but not sure I'll be rushing back. as always, loved the meal here! The dining room got an update, so it may be roomier, but didn't have the cozy feel of past years. The food, however, was outstanding and that's what we come for! Absolutely amazing place! One of, if not THE BEST restaurants in Boston, without doubt! Fantastic eclectic menu (Middle Eastern and Mediterranean) with small and main course dishes. All tasting great and novel, wonderfully seasoned. Somewhat expensive but worth the price. Wonderful wait person - personable, helpful, knowledgeable. Wonderful food - each plate was interesting and tasty. Atmosphere is low key and very pleasant. Absolutely outstanding food, creative, wonderful spices, best place to go for a special occasion. The dessert, brown butter crepes, were phenomenal, and we don't eat dessert much! We will go back. This is one of my wife's favorite restaurant, I am not so enthused. I like beer or wine with dinner, their beer list is limited and their wines are over-priced. The menu changes often, a good point, but I often struggle to find something I will enjoy and have more than once, had to order 2 appetizers for dinner. The food is very good, their coffee is not. The duck shish is recommended, one of my fall back dishes. Outdoor seating is much more comfortable than the indoor chairs/bench. If you have an achy lower back seek the outside seating,if inside bring you back pillow. So, if you are like my wife - you will love it, if more like me, not so much. Simply superb... on every level! The service was especially memorable. Shared a chef's tasting sequence; more than enough food for two, adventurous (and exquisite) choices, all leading to complete fulfillment. Just fantastic! Great service with great food and service. Food is consistently great and quite fairly priced. We come here whenever we come to Boston. I hope there are many more times left. Amazing food and professional service! My #1 fave restaurant in Boston, hands down! AMAZING is an understatement!!! We got 10 apps to share between the 4 of us, plus dessert and drinks. I want to go back right now!!! The lighting of the restaurant like many restaurants is way too dim. I saw a couple of people using their phones to illuminate their menus. The dining room is pretty packed in, a little bit too much so. We had the cacik, mushroom hummus (daily special), falafel, sultan's delight, moussaka, and two beers. The cacik was good but was a little on the sour side as they added quite a bit of lemon juice. The mushroom in the hummus was very tasty but completely dominated the hummus and you basically couldn't taste the hummus. The falafel (3 balls) dish was definitely the highlight and the presentation was very well done. The falafel was super moist and flavorful. The sultan's delight was tasty, albeit, a tad on the dry side. The moussaka was nothing to call home about, very plain. This all came to around 90 bucks. I think that's extremely high for just a few dishes and with pretty tiny portions. It was nothing mind-blowing and it was quite costly. The food was good, but not THAT good. I wouldn't go back. There are many decent Turkish restaurants that would give you twice the food for the same price without compromising on the taste. Perfect place, romantic, warm, and cozy. Extremely good food and wine matchings! Can wait to visit again. Will recommend this place to everyone. A ton of friends recommended Oleana as one of the best restaurants in Boston. We were generally underwhelmed with the food as it was pretty greasy and salty for a hyped upscale restaurant. However, the ambiance of the restaurant was romantic and cozy. We would definitely visit again but overall we were not blown away. Delicious, outstanding, and well-priced food. A bit too noisy, but very celebratory. Been there several times. Consistently good and creative food. Amazing from start to finish. A wonderful exploration of flavors. On my fifth visit to the restaurant, Oleana continues to surprise me with their combination of middle-eastern flavors, fresh ingredients, and creative recipes. The restaurant continues to reinvent its menu adding new items that maintain their standards, while keeping some of my old favorites like the Sultan's Delight. The best way to dine there is to share several different plates, so probably best to take a fellow adventurous eater! Let Chef Ana Sortun bedazzle you with her imaginative and flavorful evocation of Middle Eastern delights at this hip and happening place, with fresh ingredients from her family's farm. This is a dining experience not to be missed if you're in the Boston area. Innovative cuisine that always delights. I would come more often but it is always booked! We bring foodie out of town guests from all over the world and they always love it. And we often come for birthdays and anniversaries. In season, the back garden is lovely and romantic. People rave about Oleana. The quality of food and service is superb but there's just something I couldn't put my finger on that I did not like about the experience. We had a great secluded table in the bar, but just felt like the food was missing something special. The gourmet preparations were great but everything felt flat to me. Recommend Sarma over Oleana any day! Amazing dinner with delicious authentic dishes and regional wines to match. Ana Sortun is fantastic and the menu has something for everyone who loves good food! excellently flavoured food, great ambience, good service. Love Oleana! This was my second time there and it was delicious! Go with a group of people so you can share a bunch of meze (appetizers) instead of one large entre! You will still be full and try 5 dishes instead of one. Very unique flavors mostly vegetarian, but some fish and meat. 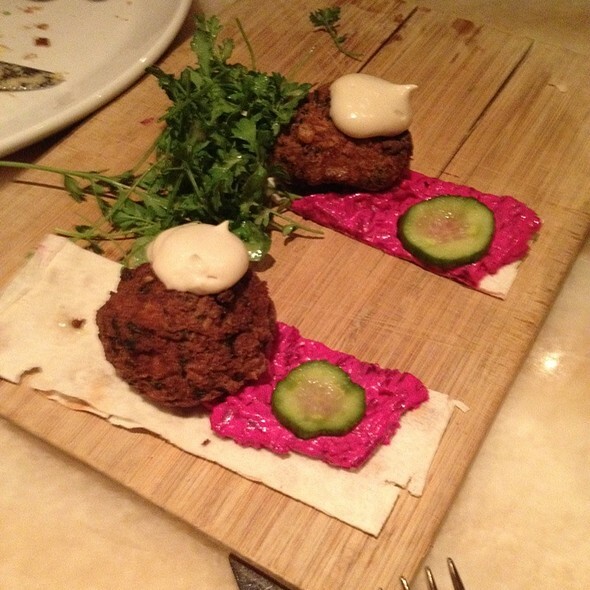 AMAZING falafel and beet hummus. Can't wait to go back. We had decided to try a Medetranian restaurant on a Saturday night. The restaurant is in a nice Cambridge neighborhood , it was a cool fall night so the patio dinning we had read about was not an option. The service was excellent , the food was good, the deserts are amazing. If your undecided about a main course you can order several different meze's which are small but a good way to taste several different dishes. Overall it was a nice night out. Oleana exceeded our expectations. We visited for my husband's birthday and the service, ambiance and food were exceptional. One of our friends stated "This is the best meal I have every had in Boston". We can't wait to go back! !